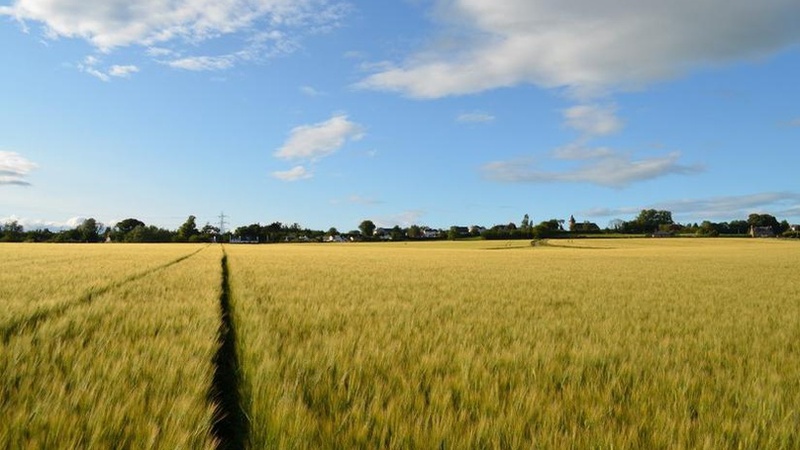 CKD Galbraith has brought several fantastic and highly productive farms to the market in the central belt, as well as a self-contained block of arable land on the Carse of Gowrie in rural Perthshire. Seaside Farm is a highly productive arable Perthshire farm on the north bank of the River Tay. The farm is located in a prime position; only one mile from the village of Errol and with excellent road links to Dundee, 13 miles away, and the city of Perth only 15 miles away. The 108.50 hectares (268.10 acres) of land that lies between 10 and 15 feet above sea level and is generally flat with a slight south-facing aspect. All the land is contained within a ring fence and has been classified as Grade 3(1) and is well suited to growing cereals, with broccoli, peas and temporary grass having all been grown successfully on the land. Lot 1: Farm buildings and about 42.19 hectares (104.25 acres) of land. The modern farm buildings consist of a store/shed and a large grain store. Available for offers over 590,000. Lot 2: About 17.16 hectares (42.40 acres) located to the north east of the holding. Available for offers over 240,000. Lot 3: About 14.87 hectares (36.74 acres) located to the east of the holding. Available for offers over 205,000. Lot 4: About 20.09 hectares (49.64 acres) located to the south west of the holding. Available for offers over 285,000. Lot 5: This lot extends to approximately 14.19 hectares (35.06 acres) of reed beds located adjacent to the River Tay. Easter Glinns Farm is a very attractive stock farm is nestled in a secluded yet easily accessible location near the pretty villages of Kippen and Fintry in rural Stirling. The sale of the 191.61 hectare (473.47 acres) farm includes a traditional five bedroom farmhouse and an extensive range of traditional and modern farm buildings. Easter Glinns Farmhouse requires refurbishment throughout but presents a fantastic restoration opportunity for new owners. The land at Easter Glinns Farm encompasses a productive block of in-bye pasture and hill grazings. The majority of which lies within a ring fence and is split into 14 enclosures with a block of amenity woodland (around 4.52 hectares, 11.17 acres). Approximately 102 acres of the farmland is down to permanent pasture with the remaining 358 acres used for hill grazing. The majority of the in-bye pasture and lower lying hill ground that surrounds the steading has been classified as Grade 4.1 and 4.2 with the remaining hill ground split between Grade 5 (3) and 6 (1). The farm buildings are situated in a U-shaped steading range to the south of the farmhouse and comprise of; three byres, several calf sheds, a lean-to, garage, lambing shed and barn as well as a store and modern shed. Easter Glinns Farm is currently for sale as a whole for offers over 720,000. Duncan Barrie, handling the sales on behalf of CKD Galbraith, said: "Both Easter Glinns Farm and Seaside Farm present the opportunity to purchase two large blocks of productive farm land in prime locations. Both are situated in stunning countryside yet are only short journeys from larger towns and cities with a range of amenities and activities." Also, new to the Perthshire market is a block of highly productive arable land on the Carse of Gowrie located to the south of the settlement of Longforgan. The Carse of Gowrie is a first-class cereal growing area of open level land between the River Tay and the Sidlaw Hills to the north. This block of land has been used to grow cereals, with peas and potatoes also having been grown very successfully in previous years. The Land at Longforgan extends to approximately 25.85 hectares (63.88 acres) and has been classified as Grade 3 (1). The land is split into three main enclosures and benefits from good access to city of Dundee, which is only 8 miles away, and Perth, which is 16 miles to the east. The Land at Longforgan is available through CKD Galbraith for offers over 315,000.